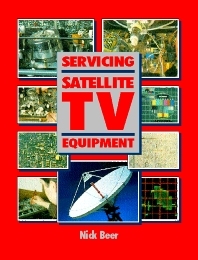 This is the definitive practical guide to fault-finding, troubleshooting and servicing satellite television equipment, both indoors and outdoors. It will take you through all areas of satellite television system servicing from the simplest fixed dish to fully motorised systems. From PAL to Mac to MPEG all contemporary systems are covered. Satellite TV systems have been installed in a wide variety of locations, using a bewildering range of equipment. That equipment is beginning to need maintenance and repair. To cope with the volume and variety of work, Nick Beer has written the first guide to satellite TV which concentrates on what to look for and what to do when it goes wrong. This book is up to date and crammed with real-life experience, not theoretical data or manufacturer's ideal specs. Nick Beer has already written the best-selling Servicing Audio and Hi-fi Equipment and is a technical correspondent for many UK and international journals such as Television. He also works as an engineer and teaches satellite servicing to technicians. Introduction; Tools and test equipment; Dishes and feeds; De-polarisers and low noise blocks; Distribution systems; Actuators and positioners; Tuners and tuning systems; Video processing circuits; Audio processing circuits; Power supply circuits; System control circuits; RF amplifiers and modulators; Decoders and descramblers; MPEG Digital Television System; Repair techniques; Appendix 1 Reference data; Appendix 2 Safety BEAB and BS415: 1990; Appendix 3 Addresses. Service Manager for an independent dealer working with TV, VCR, Satellite, audio and hi-fi equipment. An experienced bench, field and signals engineer, Nick Beer also lectures in Electronics and Media for various colleges and companies.